Because the stalls are open from the morning through the early afternoon, Campo de’Fiori is the perfect place for a late breakfast or lunch. 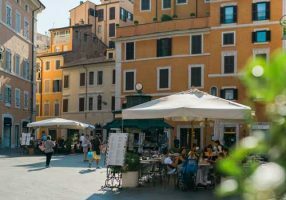 Sitting among the shoppers is sure to make any traveler feel like a local enjoying a pleasant break on the streets of Rome. 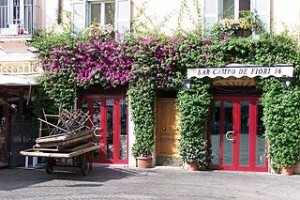 By night, Campo de’Fiori is a hub of the Roman social scene. The piazza is encircled with bars and clubs, drawing the younger crowd in for revelry. 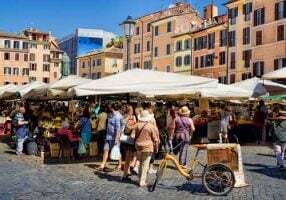 TripAdvisor calls it “the perfect place for Roman Nightlife.” While some seem to think that the partygoers are primarily Americans – making it more a tourist destination than a local secret – the reviewers rave this Campo de’Fiori is the place to be. The best way to spend the evening: find a good bar and restaurant. La Botticella is one such establishment. Closer to the piazza itself is Maranega. Enjoy outdoor seating that will allow visitors to rest their feet without leaving the piazza. Not sure where to go? No problem. Most visitors just wander and had in to whichever bar piques their interest. This might be the best option anyway – there are more than 20 situated along the piazza. on the Campo de’Fiori, the street performers might be too hard to resist. Wandering the piazza one can find anything from musicians to magicians, waiting to impress the party-goers and earn a few euro. This goes on through the night, and will surely leave even the most enthusiastic travelers looking for a comfortable bed.